This dissertation assesses the impact of policies designed to address the treatment and prevention of chronic diseases in the context of HIV and obesity, using a range of causal inference and quantitative methods. This document was submitted as a dissertation in August 2018 in partial fulfillment of the requirements of the doctoral degree in public policy analysis at the Pardee RAND Graduate School. The faculty committee that supervised and approved the dissertation consisted of Sebastian Linnemayr (Chair), Roland Sturm, and Peter Glick. 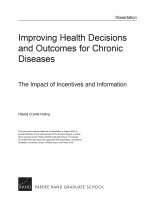 Huang, Haijing Crystal, Improving Health Decisions and Outcomes for Chronic Diseases: The Impact of Incentives and Information. Author, 2018. https://www.rand.org/pubs/rgs_dissertations/RGSD421.html.